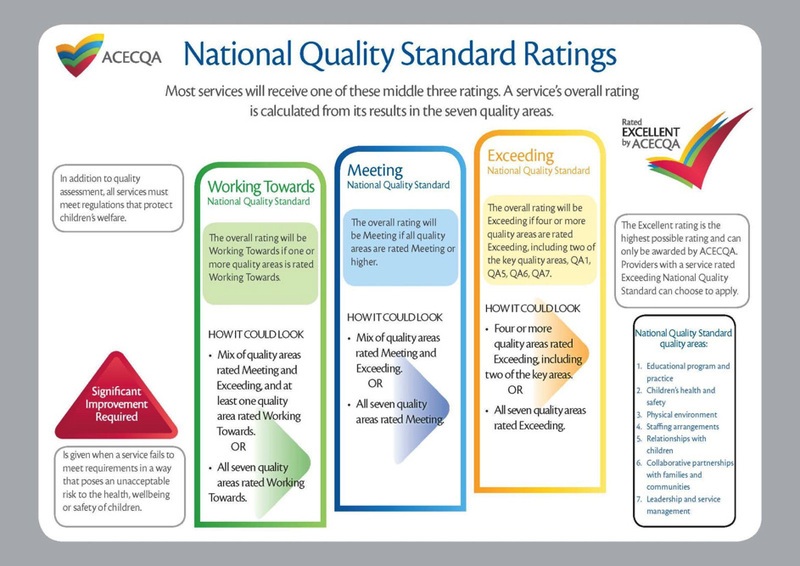 The National Quality Framework assesses and rates all Education and Care Services against the National Regulations and each of the seven National Quality Standards. The assessment is undertaken by the Early Childhood Education and Care Directorate in NSW. Once complete each service is then given an overall rating. Old MacDonald’s Child Care went through our second assessment and rating visit in February 2019 and achieved a Meeting Level. In consultation with management, staff, educators and families our Quality Improvement Plan (QIP) has been developed. Our QIP is constantly reflected on and used to drive quality practices within the organisation. All results for the assessment and ratings visits are placed on the ACECQA website. In March 2019, the Assessment and Ratings system has been updated. We will continue to reflect and review on our current practices until our next review. Educational Program and Practices Educational program and practice of educators are child-centred, stimulating and maximise opportunities for enhancing and extending each child’s learning and development. Children’s Health and Safety Children have the right to experience quality education and care in an environment that safeguards and promotes their health, safety and wellbeing. Physical Environment Physical environment is safe, suitable and provides a rich and diverse range of experiences that promote children’s learning and development. Staffing Arrangements Qualified and experienced educators, who develop warm, respectful relationships with children, create predictable environments and encourage children’s active engagement in the learning program. Relationships with Children Relationships with children are responsive, respectful and promote children’s sense of security and belonging. Collaborative Partnerships with Families and Communities Collaborative relationships with families are fundamental to achieving quality outcomes for children, and community partnerships based on active communication, consultation and collaboration are essential. Governance and Leadership Effective leadership and governance of the service contributes to quality environments for children’s learning and development. Effective leaders establish shared values for the service and set clear direction for the service’s continuous improvement. There are five rating levels within the quality standard and assessment rating process.